This afternoon I am working on my story about Ecumenical Advocacy Days for an upcoming response issue. I am writing about this thousand-fold, annual gathering of activists who make an ecumenical push to persuade Washington D.C. legislators on a topic of concern among the Christian faith community. This year was no different. The topic was Mass Incarceration and Systems of Exploitation. Wow. Heavy stuff. 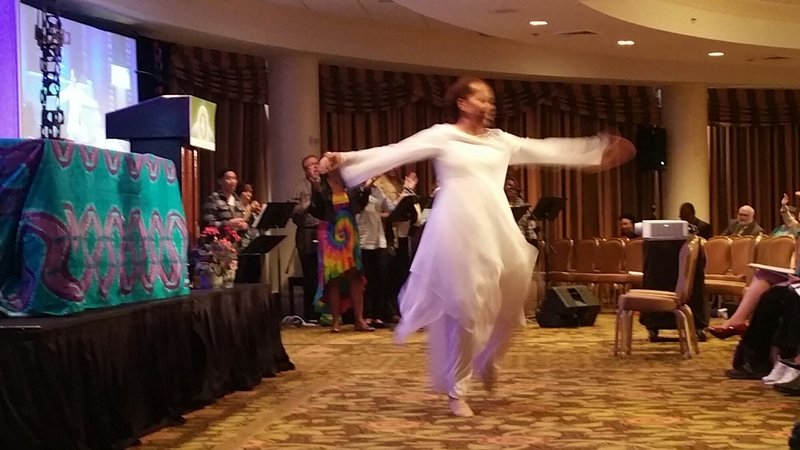 I had left the worship space in the hotel ballroom, but had to return because I had lost my folder and notebook. My notes were full of statistics and quotes. One such quote: “The United States is a mere five percent of the world population yet it hosts 25 percent of the world’s prison population” (April Johnson). Ecumenical Advocacy Days is an intense learning experience. And yet. 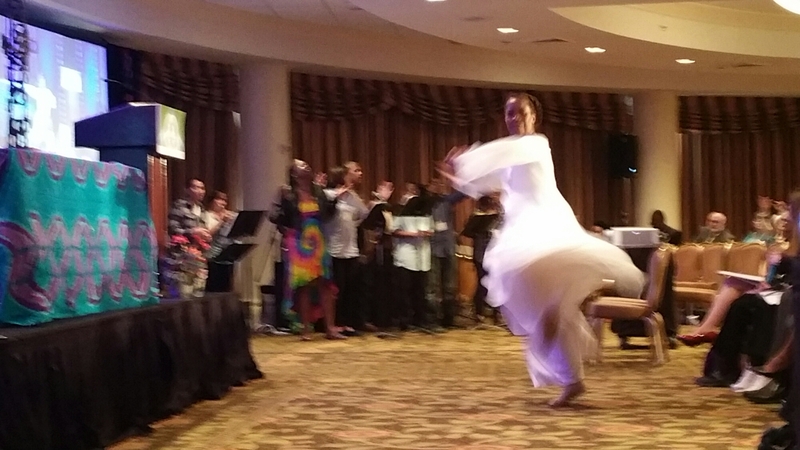 When I returned to the ballroom, there was so much joy from this liturgical dancer. Her whirling and swirling made my heart soar. The choir was singing praises, even during times of sorrow. It is for this very kind of magical moment of synchronicity that I love working for United Methodist Women. Yes, the world is full of challenging issues, and yet we find moments to celebrate and create community. We must replenish our hard work with play and praise. 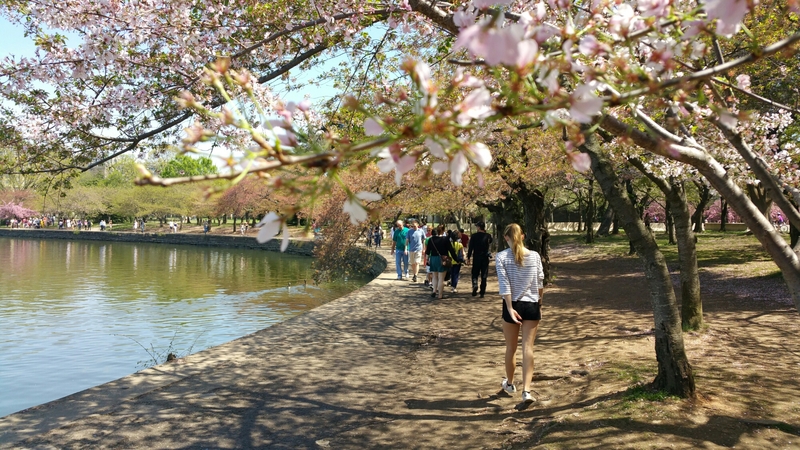 On one afternoon of the three-day event, my daughter and I found time to walk beneath the Cherry Blossom trees. It was restorative. As I work on my story about the Washington D.C. social justice weekend, reporting on the Christian community’s advocacy for the dispossessed and imprisoned, I am reminded of the journey we all take. A journey that is both joyful and sad. I am also aware that some times when we look for something we lost, we find something new. Something better. I had lost my notebook, but I found this prayer by a dancer. She seemed to tell me to find joy even in challenging times. Surely the beauty of the blossoms this time of year is also a reminder of rebirth and hope. See also: United Methodist Women Blog on Ecumenical Advocacy Days. This entry was posted in Prison ministry, Spiritual growth and tagged Cherry blossom, Christian faith, creativity, Ecumenical Advocacy Days, joy, mass incarceration, prayer, social justice, united methodism, United Methodist Women, Washington DC. Bookmark the permalink.